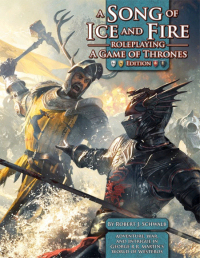 RPG Authors Robert J. Schwalb and Steve Kenson at Green Ronin have released a new edition of their SONG OF ICE AND FIRE Roleplaying Game. Not only have they revised and updated the game, they have packaged it in breathtaking cover art painted by the extremely talented Michael Komarck. The gorgeous painting depicts Robert Baratheon and Rhaegar Targaryen at the Battle of the Trident. This special GAME OF THRONES edition gives you everything you need to play and run games in the Seven Kingdoms using an easy-to-learn system specifically designed to evoke the atmosphere of the best-selling novels and the popular HBO series. Included are the entire contents of the original rulebook, revised and updated, plus the full-length adventure “Peril at King’s Landing.” Players can take on the roles of key members of a noble house navigating the dangerous waters of Westerosi politics and intrigue.